Bestselling pen style sub ohm vape kit by SMOKTech. The TFV8 Baby tank has a unique hinged lid to make filling with e liquid clean and easy. Holding the tank upright, locate the opposite side of the hinge then push the top of the tank counter-clockwise, in the direction of the arrow. The hinge will open and you’ll see the chimney in the centre and a slot to the side for filling the tank. Aim the nib of your e liquid bottle into the slot and squeeze in your e liquid, making sure that you don’t get e liquid into the central chimney or over-fill the tank. Once you’ve filled the tank, push the lid back into place. If you’re using your kit for the first time or have just installed a new coil, make sure that you prime the coil. To do this, simply leave the tank standing for a few minutes after filling with e liquid before you vape with it. 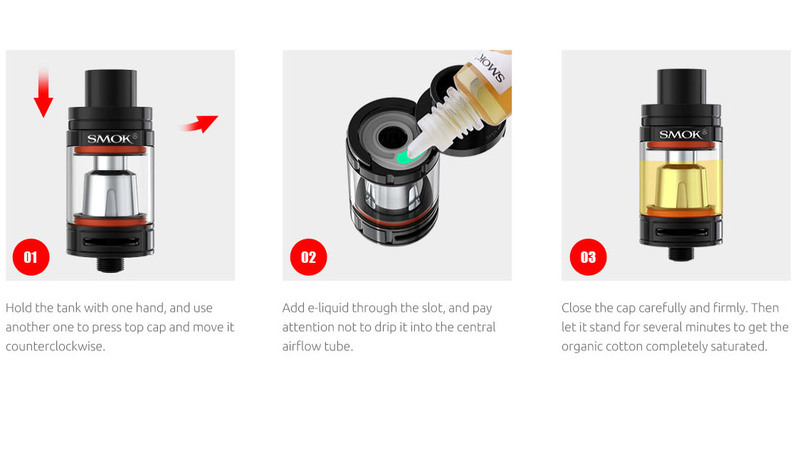 You can also help this along by squeezing a few drops of e liquid directly onto the cotton through the slots in the side of the coil before installing it in the tank. If you start to notice a slightly burnt taste when vaping with your SMOK Stick kit, it’s time to change the coil. You can buy M2 coils for the SMOK TFV8 Baby Beast here. To do this, unscrew the tank from the battery. Hold the glass part of the tank and with your other hand, unscrew the bottom of the tank. The coil should unscrew along with the base. If it doesn’t, screw the base back on and press down firmly while you unscrew it again. This should catch the screws on the coil back onto the base. However, if the coil still remains in the tank, put the base to one side then put your finger on the end of the coil and push the tank glass towards the coil. The glass will detach from the tank and you’ll be able to unscrew the coil by hand or using pliers. Once you’ve removed the coil, simply screw a new one in and prime it before vaping (see above). You might want to give your tank a clean before you put a new coil in. Simply run all parts under warm water then thoroughly dry each piece before putting your tank back together and fitting a new coil. Try not to lose any of the seals on your tank when doing this as that might cause it to leak. If you do lose any of them, don’t worry as you’ll have some spares in your kit. To power on or turn off your battery, press the button 5 times in quick succession. The LED will flash 3 times to indicate it has been switched on or off. To vape, simply press and hold the power button whilst inhaling. The LED will light up white whilst in use. Plug the micro-USB end of your charging cable into the charging slot on your battery and plug the other end into a USB charging port. There is a charging indicator just below the micro USB port on the battery. This will light up red when charging and go out once the battery is fully charged. Remember to never leave a charging battery unattended and do not charge your batteries over night. You can view more e cig battery safety information here. 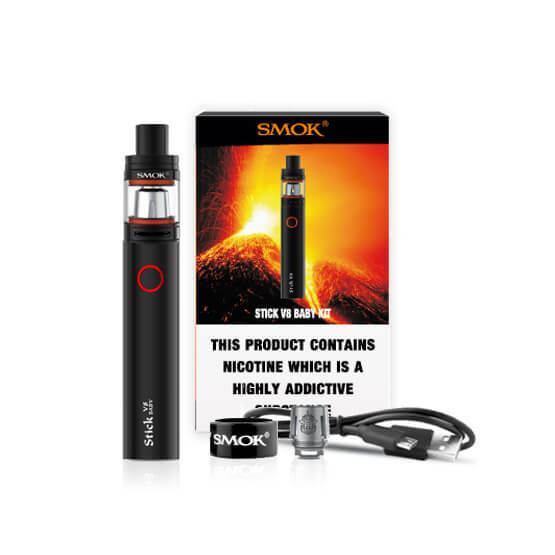 We hope that these SMOK Stick V8 instructions help you get started with your kit. If you still have any questions then please do not hesitate to contact us.